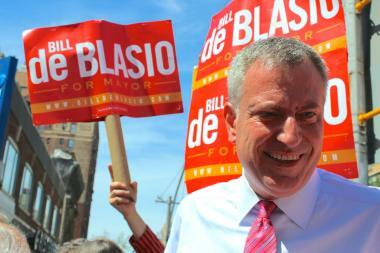 The mayor was expected to unveil his new plan on Tuesday to address the homeless crisis in NYC. CITY HALL — Mayor Bill de Blasio vowed Tuesday afternoon to open 90 new homeless shelters and cut the city's homeless shelter population — currently at a record high of 60,000 — by 2,500 over the next five years. The mayor's plan, first reported by the New York Times, would expand the current shelter system by roughly a third of its size, while shuttering the 360 controversial "cluster sites" and commercial hotels they are currently using to house the city's homeless. "This is a commitment to do something different," the mayor said Tuesday. "We will make progress, but it will be incremental. It will be slow, but I believe it will be steady." The mayor's plan, outlined in a report released with his announcement, promises to clear out all cluster sites by the end of 2021 and commercial hotels by the end of 2023, while opening 20 new shelters a year in 2017 and 2018. The plan specifies that of those 20 shelters a year, five will be "new high-quality" sites, while the rest will be opened in existing buildings. An additional 30 existing shelters will be expanded beginning in 2018, continuing "on a rolling basis" for the subsequent seven years." "To avoid disrupting the lives of people already housed in these buildings, the city will open 12 temporary locations for them," the report says. There are currently 275 shelters overseen by the city's Department of Homeless Services, subsidized by a combination of federal, city and state funding. As DNAinfo New York previously reported, advocates are worried the federal Temporary Assistance for Needy Families (TANF) funding, which pays for a large portion of the city's family shelter system, could be threatened under a Trump administration. That could decimate de Blasio's plan to build more neighborhood-based shelters. De Blasio's handling of placing homeless in communities across the city has come under fire, most recently at a Holiday Inn in Maspeth that dropped plans to house the homeless after a huge outcry from neighbors. The city's subsequent approach to dealing with the exploding homeless crisis, which relied on housing families and individuals in hotels or cluster sites, including one where a child was burned to death by an exploding radiator, garnered strong criticism as well. In a recent interview with DNAinfo New York reporters and editors, Comptroller Scott Stringer criticized the mayor for not engaging communities in the fight against homelessness. "We're playing with fire in these fleabag motels," Stringer said, advocating for the mayor to take a "community-based planning" approach. "You have to build consensus and you have to identify how we’re going to get community and providers to work together," Stringer added, saying city officials "feel it’s an inconvenience to have discussion with community boards around the city." Stringer previously released a report highlighting 1,150 vacant parcels of city-owned land, suggesting they could be used for homeless shelters and permanent affordable housing. The administration countered that only 600 of the parcels were suitable for housing, and said they have plans for those parcels, but declined to elaborate on what those plans are. "You're in a crisis. Put everything on the table," Stringer said, "Between 2014 to now, this system has gotten totally away from city government." Stringer pointed out that when the Maspeth backlash was in full force, he went out to the Queens neighborhood and engaged community members in conversation on the issue. "I took my share of heat. But you gotta show up and you have to engage," he said. "You have to have a little bit of Mario Cuomo in you. You have to relish the fight, embrace the debate." In a report released with his Tuesday announcement, de Blasio said he was "reforming the way we communicate with neighborhoods" by having "a clear shelter opening notification framework," siting shelters "more equitably" throughout the city and establishing "community advisory boards" for each shelter. The board "will ensure an open dialogue around shelter issues directly after new sites open," the report said. In his speech, de Blasio vowed that communities will get at least 30 days notice before any new shelter opens, but added, "That does not mean if there are protests we will change our mind."